Hot! That’s the word I would describe the weather yesterday and again today. Looks like we might have a chance for showers sometime this afternoon. Monday is also forecasting possibility of showers in the afternoon. Tuesday, slight chance in early afternoon and more of the same for Wednesday. Temperatures are forecast to be in the 90s all week! Time to go stand in the water! Generators were scheduled to be off yesterday morning. However, they were on until 9:00 a.m. when they turned them off, and they remained off until the projected time of 1:00 p.m. when they turned on one and eventually had all four units going for a couple hours. Back off by 9:00 p.m. and they are off this morning as projected. Scheduled to run around 2:00 p.m. today. Tomorrow they are to run a low one unit until noon and at 3:00 p.m. they will probably have four units going and plan to open the flood gates at that time for two hours. The four units will remain on until 8:00 p.m. when they start shutting back to a low one. Fun day on the water Wednesday and Thursday for Jim. He had one of his customers, Jack his grandson, Zac, on the water. Zac said he smoked his grandfather! They were fishing the tiger tail, pink San Juan worm and the ruby midge. Stan out on Thursday with Tony from Illinois. All their fish were caught on the red San Juan worm. Carolyn was working with a new lady who wants to learn. Another woman fly fisher, Jody, will be walking the rivers now. We went through as much “stuff” as we could cram into a half day trip, including stripping. It was the holographic green crackleback on the sinking leader. And, she is throwing a nice line. Friday Stan took one of his regular, regulars, Ken out for half a day. Took a little to find what they wanted, but they finally honed in on an orange egg pattern below the big ruby. Generation was up then down Friday. Made it a little tough! Saturday, Stan had Brian out for the morning. Water was supposed to have been off, but it was on….at least until 9:00 a.m. when they shut it down. Jim had Brian’s son and future son-in-law, Nathan and Adam, out for the morning. This was everyone’s first time fly fishing and I don’t think it will be their last. Jim’s guys caught on the tiger tail, ruby or P&P midges, and a scud pattern. Brian was catching on the copperhead black zebra midge. Dana and Carolyn decided to seize the opportunity of fishing with the water off. We jumped in the drift boat, rowed over across from the boat ramp, into the water and hooking up with fish on the copperhead black midge under the ruby 2 and Dana. and the holographic green crackleback trailing the tiger tail for Carolyn. Wonderful three hours! 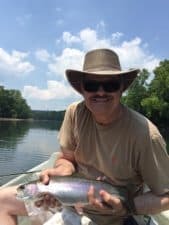 This entry was posted on Sunday, June 12th, 2016 at 11:22 am	and is filed under Fishing Reports. You can follow any responses to this entry through the RSS 2.0 feed. You can leave a response, or trackback from your own site.